← Track. And a field. I am not actually certain that this playground equipment was the newest thing in town, but my quick visual inspection indicated that it might be. Also – in case you’re planning a visit and want to fit in – the town’s pronounced “Medda.” Really. I’m not setting you up for ridicule or anything. That’s how we talk out here. 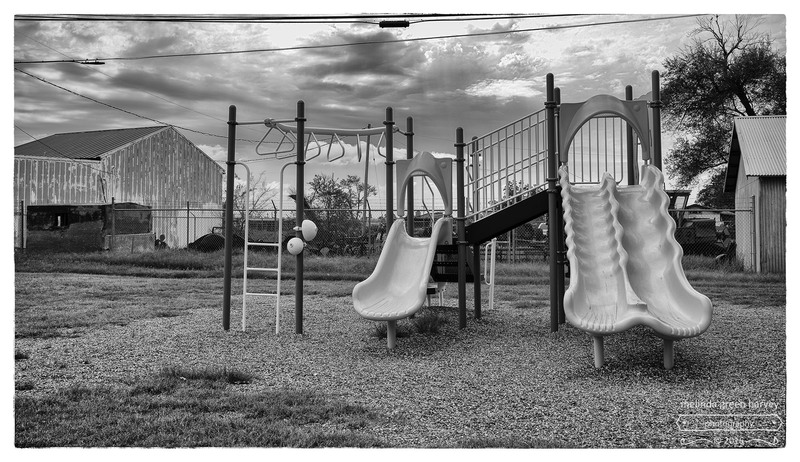 Posted on October 8, 2016, in Photography and tagged 365 photo project, black and white photography, Leica, Meadow, Meadow Texas, melinda green harvey, monochrome, one day one image, photo a day, photography, playground equipment, postaday, texas. Bookmark the permalink. 6 Comments. Must have been some of those early Tennessean folks that helped settle down your way that named it and speak it. There’s some kind of linguistic link between Texas and Tennessee. You should try pronouncing dome English place names. We used to live close to Towcester – pronounced ‘Toaster’. Not many people got that one right without a little assistance! There are towns around here that have names rooted in Spanish but that are pronounced as though they were English. There are LOTS of towns that could use them!